To be strictly accurate that is not the right answer. 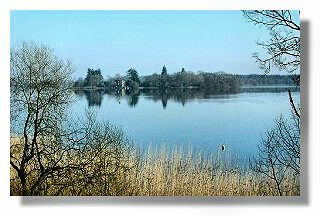 The Lake of Menteith is Scotland's only inland "natural" body of water. There are also a number of man-made lakes - Pressmennan Lake in East Lothian is an artificial reservoir constructed in 1819. It lies in a gully in the Lammermuir Hills, above the village of Stenton. It is roughly 2 kilometres in length but less than 100 metres broad. Others include the Lake of the Hirsel in the Scottish Borders and Lake Louise (within the grounds of Skibo Castle). Just to muddy the waters (as it were), there is also a sea bay near Kirkcudbright known as Manxmans Lake.